"I'm not like a particularly fancy cook. I mean, I recognize the irony in that because I have a cookbook, but I still feel like I'm very much a good home cook." This week, we're excited to welcome Jessica Battilana to SALT + SPINE, the podcast on stories behind cookbooks. 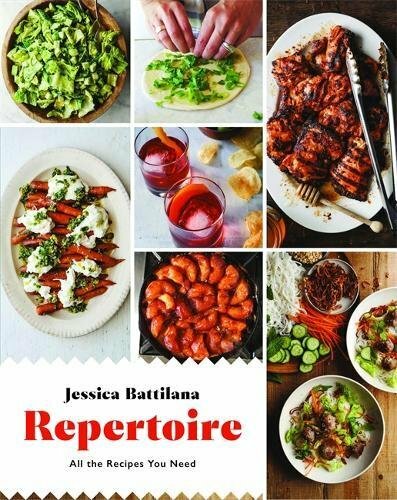 Jessica is the author of Repertoire: All the Recipes You Need, which features 75 "real recipes, from real life, that really work." Previously, Jessica wrote Corn (Short Stack), and co-authored six cookbooks, including Home Grown: Cooking From My New England Roots with Matt Jennings, Vietnamese Home Food with Charles Phan, and Tartine Book 3 with Tartine owner Chad Robertson. We sat down with Jessica at San Francisco's The Civic Kitchen cooking school to talk about the stories behind Repertoire.